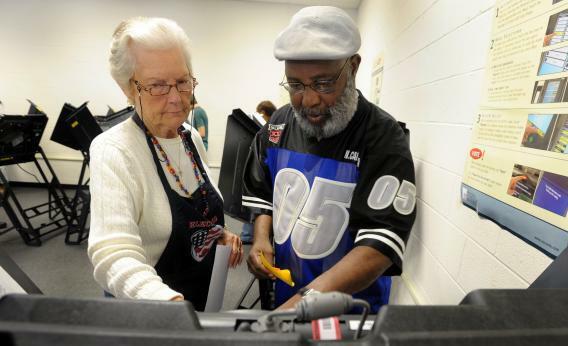 Board of Elections employee Frances High assists Manuel Sanders with using the electronic voting booth at an early voting site on October 18, 2012 in Wilson, North Carolina. Ryan Reilly is all over the details of the new post-election voting reform commission, to be chaired by Obama 2012 attorney Bob Bauer and 2012 Romney (and 2000 Bush) lawyer Ben Ginsberg. For a little while yesterday, this sent voting rights advocates’ hearts aflutter. They regained their balance today, and wonder why Obama didn’t ask for more. Michael Yaki, a Democratic appointee on the Commission for Civil Rights, took a whack at the idea on Twitter, so I emailed him to ask why he was skeptical. The “Election Assistance Commission,” created by the post-2000 Help America Vote Act, came up with a series of recommendations that led to a few solid reforms, like early voting, but did not anticipate the backlash against extra voting days and the persistence of asymmetrical polling booth management from rural areas to cities.